Highest Efficiency, Performance & Dependability. Mono Vs Poly, What's the Difference? Which One is Best? Multicrystalline solar cells are semiconductor photovoltaic (fancy word for solar) material composed of variously oriented, small, individual crystals sometimes referred to as polycrystalline or semi crystalline. Monocrystalline is a silicon wafer made from a single silicon crystal grown in the form of a cylindrical ingot. Monocrystalline, or single cell technology, is slightly more efficient than polycrystalline solar panels when tested in factory conditions. However, Mono panels cost more than Poly panels and the energy production difference is usually a small improvement with all other things being equal. In a computer performance model comparison, the difference between the two types of panels on a 12 kW home solar system over a years time with all other things being equal is nearly the same. ● Click the Tab Above ⇑ Panel Performance & How Panels are Made to Learn More About Solar Panels. The price of solar panels are largely determined by the number of watts, the rated efficiency, the manufacturer and factors such as point of origin. We consider the solar panels we sell as a commodity product of same quality or fitness for use with the only differentiating factor being the country of origin, clear frame Vs black frame or Mono Vs Poly. All our solar panels are UL listed and have been certified by numerous independent testing laboratories with warranties at 25 years regardless of the manufacture. Anything less than 25 year warranty and not UL listed should not be considered. Despite warranties, the life expectancy of most solar panels is 50 years or more. Solar works well in all climates and all elevations. Panels installed in the 1960's that are still producing 70% of their original rated power output. Solar Panels Ship in 3 - 5 Business Days After Funds Clear. Freight Costs? Add Item & Quanity to the Shopping Cart Which Will Calculate Freight Costs to Your IP Address. Solar systems rarely operate at STC performance levels. An "I-V" curve is a graphic representation of all possible voltage and current (amps) operating points for a solar panel in different conditions. I-V curves of panels depend upon temperatures and the amount of sun so modules are usually only partially loaded throughout the day. From sunrise to sunset the amount of sun on the panels varies more than the temperature. The changes in irradiance (fancy word for sun in a given area) affect the panel current most of all since the current is directly dependent on the amount of sun hitting the panel. When the irradiance drops by 1/2, the amount of electricity generated by the panel drops by 1/2. By contrast, the maximum power point (MPP) voltage stays relatively consistence with the changing sun light. The example is based on a 150 watt 4 volt module but most solar systems are connected in series so the changes in MPP voltage can add up to much more than what is shown in the example. Additionally, temperature affects the solar panel voltage much more than current. When we design an off-grid battery based solar system, we look at the location and the voltage of the battery bank to make sure at a minimum, the system will produce 20% more voltage than the battery bank requires to recharge on hot days where the system will be located. In the wintertime amp (current) output rises dramatically in cold weather. Panels work better in the cold than in the heat given the same solar irradiance. It is common for a panel to outperform it's STC rating during extremely cold days so the charge controller (off-grid systems) and inverter (grid-tied systems) that is selected needs to be rated for the climate in which it is going to be installed. *STC - To learn more about solar panels and how they are measured you need to know what STC stands for. STC in an acronym for "Standard Test Conditions". All solar panels are rated in watts. The watt rating is how much power the panel will produce in full sunlight at 25 degrees C (77F). This is the industry standard (STC) for all PV panel ratings (PV means Photovoltaic which is a fancy word for solar). Solar panel manufactures have long used this test standard which is 1,000 watts per square meter solar irradiance, 1.5 Air Mass and a 25 degrees Celsius cell temperature. PTC is an acronym for "PV-USA". The PV-USA test conditions were developed at the PV USA test site at the University of Davis, California for standards established by the California Energy Commission that are considered closer to real world conditions (Real World Vs. STC factory test conditions). The PTC rating test is 1,000 watts per square meter solar irradiance, 1.5 Air Mass, and 20 degrees C ambient temperature at 10 meters above ground level and wind speed of 1 meter per second. In California, solar panels manufactures must be tested and rated independently at the PV USA test facility at the University of Davis (CA) to be considered for rebates. NOTE: Neither PTC nor STC account for "real-world" losses. Actual solar systems will produce lower outputs due to soiling, shading, module mismatch, wire losses, inverter and transformer losses, shortfalls in actual nameplate ratings, panel degradation over time, and high-temperature losses. On the inverse, solar panels may out produce their rated power in cold high altitude locations. Canadian Solar panels ranked among the highest efficiency panels in the industry, bringing customer values of more energy production. Best Warranty Insurance, 25 year worldwide 100% warranty term coverage providing third party bankruptcy rights. Non-cancellable, by 3 top insurance companies. Myth Vs. Fact. Solar Does Not Work On Cloudy Days. Myth - Solar creates electricity from visible light. Did you ever get sunburn on a cloudy day? Cloud cover reduces the power of a module by a third or less than it's sunny day output. Even in the fog in San Francisco, solar panels will produce up to 40% of their rated power. Solar performs well in all climates, latitudes and altitudes. IE: Germany has installed about 40% of the worlds solar power accounting for about 7% of the countries electricity generation but only has about the same amount of average sun (Solar Irradiance) as Fairbanks Alaska. 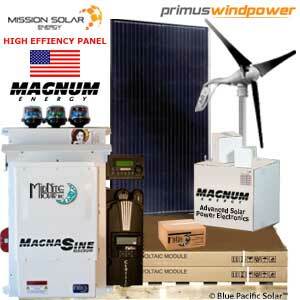 Mission Solar Energy, proudly assembled in the USA, is headquartered in San Antonio, TX with module facilities onsite. Mission Solar hardworking team calls Texas home and is devoted to producing high quality solar products. Our supply chain includes local and domestic vendors. 25 Year Warranty, UL Listed. Developed in California, Solaria PowerXT® high performance, high density solar panels produce panel efficiency of up to 19.3%. 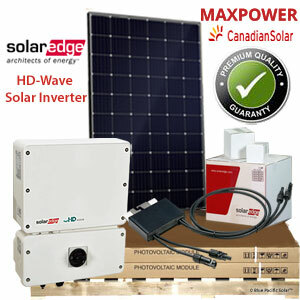 The PowerXT module provides a visually stunning appearance compared to any other solar 25 Year Warranty, UL Listed. What happens when you mix different watt (sizes) & brands of solar panels? In most situations mixing dissimilar panels in the same solar array is not ideal, but also not a problem. Here is what happens. 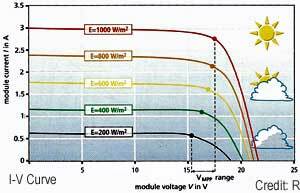 When paralleling panels of different current (amps) ratings, the output of the array will simply be the sum of the combined voltages. The lower voltage units will begin to taper off sooner as high battery voltage is reached. If the solar panels are used for direct power, the array voltage will be the approximate average module voltage. When series connecting strings of dissimilar panels, the current (amps) will be approximately that of the weakest panel in the string. Panasonic has been a pioneer in solar power since the green revolution began. As one of the earliest adopters in 1975, no one has spent more time on solar power research and development. That’s why Panasonic believe their high-efficiency HIT® solar modules are the most efficient available today. 25 Year Warranty, UL Listed. Founded in 1997, Trina Solar is the world's leading comprehensive solutions provider for solar energy. Trina Solar now distributes its solar products to over 60 countries all over the world. 25 Year Warranty, UL Listed. 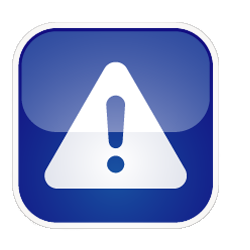 Need Help With Permit Documents? 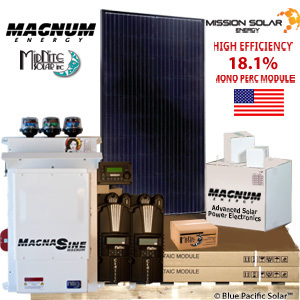 Blue Pacific Solar® permit document service is offered as a value added service for our customers only who purchase our grid-tied or off-grid packages of 18 panels [Minimum] or more. The building permit document permitting service service is available for most states to help you get through your local jurisdiction building permit process. Our team of professional designers can provide the documents, blueprints and expertise needed to work with any building department nationwide. Harnessing the power of the sun seems both ancient and incredibly futuristic. Any given day, the earth receives 6,000 more times the solar energy it needs to power its current needs. The life-sustaining power of the sun that was worshipped in antiquity has become the energizing force of today powering homes and eventually even the cities of tomorrow. While people have been benefiting from and learning about solar energy for untold centuries, the actual solar revolution we are experiencing today began in the twentieth century with the production of the first practical photovoltaic (PV) cell in 1954. Since then, the power of the solar panel and its eventual commercialization is one of the driving forces of the alternative energy future the world is working toward today. The solar or photovoltaic (PV) cell is essentially the building block of the solar panel. In 1839 at the age of nineteen, A.E. Becquerel made the first solar cell in France. Regarded as a marvel, this early solar cell wasn’t improved upon until 1883 when selenium was used as the cell’s semiconductor. It wasn’t until 1905, however, that the photovoltaic effect was thoroughly explained by the likes of Albert Einstein who wound up winning the Nobel Prize as a result of his explanations in 1921. Of course, the practical solar cell didn’t come about until 1954 when Bell Laboratories created a silicon-based cell that demonstrated a 6% efficiency rate (the earlier cell only demonstrated .5% efficiency). By 1960, the solar cell’s efficiency hit 14%. The 1960s and 70s would see a demonstrable increase in scientists working to make solar commercially viable from a price per watt standpoint. It wasn’t until the American energy crisis of the 1970s, though, that solar really hit its stride and improvements in the technology would finally launch solar as a viable commercial option for electricity in the 1980s. From the 1980s on, solar use and solar advances have increased steadily, albeit with occasional dips, in both North America as well as other parts of the world. Today, Germany leads the solar initiative with more solar production and penetration than anywhere else in the world. Advances in solar cells and solar panels are now beginning to challenge traditional fossil fuels in terms of both efficiency and cost. Yet solar is clean energy and its sustainable renewal has more and more people around the globe energizing their homes with the power of the sun. In the remote villages of many developing nations where electricity has never been used, people are skipping fossil fuels altogether and going straight to alternative and eco-friendly energies like solar. Though not the largest user of solar energy, China is the world’s leading producer of solar cells. Currently, Germany is producing so much excess alternative green energy using solar that it is now selling this power to neighboring nations. A ton of sand used to make photovoltaic cells produces the equivalent amount of energy as 500,000 tons of coal burned up in a power plant. A plane fueled by solar energy crossed the United States in 1990 exciting the world with the real possibility of moving beyond reliance on oil and other fossil fuels. While a mere few decades ago most U.S. residents could not afford to install solar power systems in their homes, today with wholesale prices of the best solar panels, costs represent a 400% decrease from costs three decades ago. To better understand the cost of the different types of solar panels and what makes one cheaper and one more expensive, we need to look at the two most common module materials. Monocrystalline silicon solar panels are made from a ingot of highly pure poly silicon melted and mixed with boron. The monocrystalline silicon seed is dipped into a molten bath over many hours until it grows into a large cylindrical crystal. Monocrystalline solar used most commonly on homes and businesses have an efficiency of 14% to 17%. Canadian Solar, Mission and Panasonic polycrystalline silicon modules are made from a cast of many silicon crystals because it makes for modules that have different performance characteristics than monocrystalline solar panels. You can usually tell the difference between the most efficient solar panels which are monocrystalline and the cost of polycrystalline solar panel not just because of cost, but polycrystalline solar panels generally have a blue hue Vs. the black color monocrystalline solar panel. 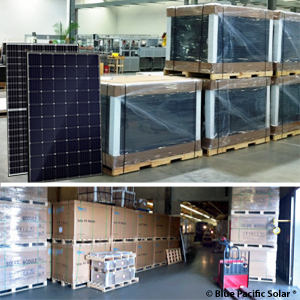 At Blue Pacific Solar® a question our consultants are asked often is what is the most efficient solar panels? Efficient solar panels are calculated on the ratio of power output to power input. What that means in laymen's terms is solar irradiance (the suns energy) is multiplied by the area of the solar device to determine the watts of solar power. (Electrical Power) The more of the suns energy (solar power per sq. meter) that is converted to electricity as a relationship to the size of the solar module, hence, the higher the efficient solar panel. The real answer to the question depends on the usage. As an example, thin film solar is not as efficient as monocrystalline or polycrystalline solar panels, but does better in extremely hot environments. Solar panels are formed from many solar cells wired together to form a solar panel or module. Solar panels are constructed from solar cells that are sandwiched between several layers of protective materials, supported by an aluminum frame with some type of glass cover. Where you start to really see the difference between cheaply constructed and best quality solar panels is in the assembly, materials used in the panel parts and how many blocking diodes a panel may have. Higher quality solar panels have more blocking diodes (which improve performance is slight shading issues exist) and use higher quality low iron glass and durable frame materials. Bypass or blocking diodes are used to pass current around rather than through a group of solar cells. The electrical current is allowed to pass around a cell or group of cells that have been shaded or develop an open-circuit condition. This process many timesdistinguish the difference between cheap PV modules and best solar panels where higher quality standards are adhered to. Trina Solar, Solarworld and Suniva solar panel manufactures set a high bar for all other residential solar panel companies. You can buy cheap solar panels, but be careful you are getting a quality product not a defective or flawed rejected panel which sometimes are sold as type A panels without blemishes.